A Rinkya Blog: Hello Kitty Wrestling Match! I have no idea if wrestlers are going to be dressed as these characters or what, but the poster caught my eye and I had to share! Beloved cat of Japan, Hello Kitty makes her wrestling debut against Kuromi Saturday April 5th in California. Kuromi is the rival of My Melody from the anime Onegai My Melody. 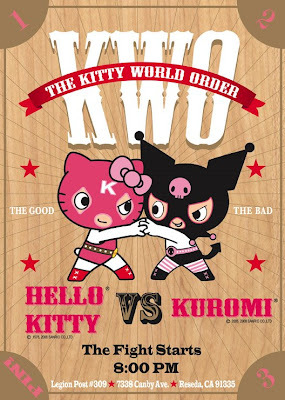 The KWO (Kitty World Order)is the name of the organization, so maybe we will see more characters fighting! For all our Hello Kitty Posts read here!